This acetate first was thought to be from circa 1972. But some years ago in an interview Brian confirmed that in 1975 it was re-recorded as new version for a possibly new release. Interestingly, the “long” track is refered to as a “long lost retake” on the hollywood version. Interestingly, the “long” track is refered to as a “long lost retake” on the hollywood version. The short version sounds like a “butchered” edit, in that the 30 missing seconds seem to be one bit pre drum solo, and another missing piece post drum solo, but as it is unreleased elsewhere. About the label: Master Room is indeed a London-based audio production company. It is not a ‘proper’ recording studio; it is more like Chop ‘Em Out. It specializes in sound postproduction (editing, mastering, etc). 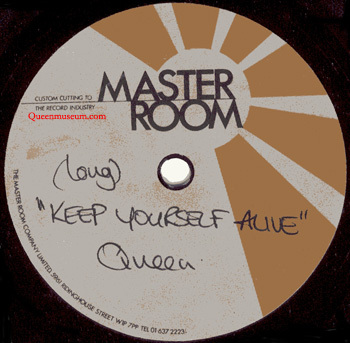 Given that Trident had cutting facilities, Probably QUEEN/Trident commissioned a radio friendly edit of the Keep Yourself Alive re-take from Master Room, perhaps considering it for a single release. This acetate might be one of the tests sent back from the company to them. It is common to include also the un-edited version in such tests, for comparison. Or maybe Master Room mastered the track aswell (prior to editing), so they needed the reference. 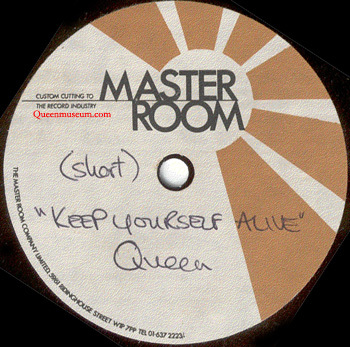 While it can be figured out why QUEEN did not use this version in the single (it has an even slower opening), I wonder why they did not use it in the album. …And if it was meant for it or not. The apparent contradiction between both HR names (I mean: “re-take” but “original”???) could be solved if we think of it as “original for the album”. Of course this is all highly speculative.